LAS VEGAS—Last year, Intel announced the Quark , an embedded processor that Intel said would fuel the wearable market. On Monday night at CES, Intel announced the “Edison,” the next-generation of Quark, along with a ton of wearable prototypes—including, yes, the obligatory smartwatch. As the main microprocessor supplier for PCs, notebooks, and servers, Intel’s business is to raise its OEMs upon its shoulders, building the fundamental capabilities into its chipsets that Intel hardware partners can later sell to consumers. And, as Las Vegas learned long ago, a little sizzle always helps sell the steak. Krzanich’s Monday night keynote promised a journey from a world of transformative devices to immersive experiences. He began with wearables, a category that he said had been plagued by the fact that, to date, wearables have required a second device—a smartphone—to make them come to life. Intel chief Brian Krzanich holds the “smart earbud” Intel developed, with the “Jarvis” digital assistant whispering in the user’s ear. Runners typically bring phones on their exercise, and want to track their heart rate as well as their distance. So Intel came up with a smart earbud, connected to and powered through your phone’s audio jack. “An app, your phone, and a smart earbud, and you can go on your run you can go on your bike ride, and everything’s there,” Krzanich explained. Then he went one step further: He took the smart headset, code-name Jarvis, and synced it with a user’s email, calendar, and contacts. In a demonstration, an executive searched for a local restaurant, which informed him that he had a scheduling conflict. When he agreed to go the restaurant anyway, Jarvis agreed to notify a colleague of the conflict. It’s hard to say if Jarvis was a prototype of a personal assistant, or if it was fully developed. Among the wares Intel showed off at its 2014 CES keynote was a smartwatch. Because of course. And, of course, Intel has a smartwatch—that requires no tethering. It even has smart geofencing, which can show when a child or relative has strayed outside the predetermined zone. If a person steps outside the virtual fence, it can send an alert. “It’s not like anything else out on the market,” Krzanich added. All of these products appeared to be prototypes, but Krzanich promised “a whole new series of products that we’ll bring to market” via partners, including style maven Barneys, CFDA, and Opening Ceremony. Meet Edison, Intel's newest chip for wearables. Krzanich then launched Edison, a successor to the Quark embedded processor that Intel launched at the Intel Developer Forum, but made using a 22-nanometer process. It runs Linux, and features Wi-Fi and Bluetooth low energy. It even integrates Mathematica, and Wolfram Alpha’s language processing. Alongside Rest Devices, a small startup from MIT, Intel created a “smart onesie” that measures pulse, temperature, and breathing. The onesie not only monitors body heat, but it can also project a display on something like a coffee cup if the baby gets too hot. And if the baby’s hungry, the onesie can signal a bottle warmer to start up. Krzanich then announced a content for the best wearable design with a whopping $1.3 million in prizes. The top prize will be $500,000, and the winners will be connected with the top executives at Intel to take their products further. For security, the phones, tablets, and other wearables will be protected by Intel’s McAfee division. “We want to bring this capability to everybody, because we think this is critical” Krzanich said. All mobile devices—tablets, phones, wearables powered by Intel or by other suppliers—will be protected by McAfee software under a new offer by Intel. And all for free. “We believe this will allow this ecosystem to flourish,” Krzanich told the audience. A few years ago, Intel made a big bet on Ultrabooks. More recently, Intel has begun pushing two-in-one devices. But what if you wanted Android? The answer is Intel Device Protection Technology, which will be used to secure Android in laptops and tablets for IT admins too leery of introducing Android into their enterprises. It will be available this year. But customers didn’t stop there. They wanted more choice—a dual-OS platform that runs both Windows and Android. And so Intel helped launch what some called “PC Plus” a few weeks ago: With a touch of a button, you can switch between Windows and Android. Earlier on Monday, Intel announced the RealSense brand and launched a 3D camera that several top-tier OEMs will build into various laptops, tablets, and all-in-ones. The integrated cameras will allow PC owners to perform everything from “air gestures” to facial tracking to games, all without having to actually touch a PC. Krzanich showed off the camera “scanning” an Intel bunny suit doll, then sent the model to a 3D printer. “You can create the environment. You’re part of the environment,” Krzanich said. Likewise, Intel took the book Leviathan—a story about a flying whale ship—and “projected” it onto video that it took of the audience. “All it really requires is a tablet, a story, and imagination,” Krzanich said. 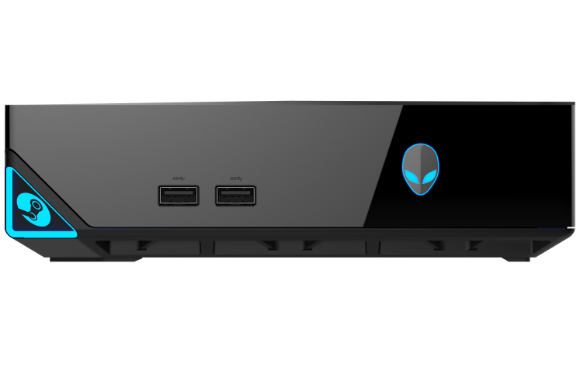 Krzanich then invited Gabe Newell, the brains behind Valve Software and hits like the Half-Life series to show off his company’s new Steam Machine PCs, which it’s developing with partners like Alienware and Digital Storm. Essentially, the tiny boxes are PC “game consoles” that can run the Steam gaming service that Valve developed. Finally, Intel also announced that every microprocessor the company announced in 2014 will be conflict-free, with minerals apparently bought from somewhere other than Central Africa, where supplies of tantalum, tin, gold, and tungsten fuel a bloody conflict. Under Krzanich’s helm, Intel has a made a renewed push into wearables. Can it use the CES hoopla to oust ARM, the leader in the space? So far, the smart money would say no. But Intel’s Edison certainly has launched a high-profile challenge.